First off, I want to thank Ed Chesnovitch for his great photo of this marsh. Living in Colorado doesn't allow for much marsh scenery, so I am grateful to Ed and the composition he captured. 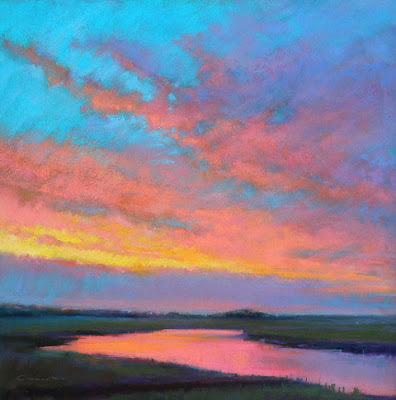 Ed is a very accomplished Cape Cod artist and I would encourage you to visit his website and sign up for his newsletter. 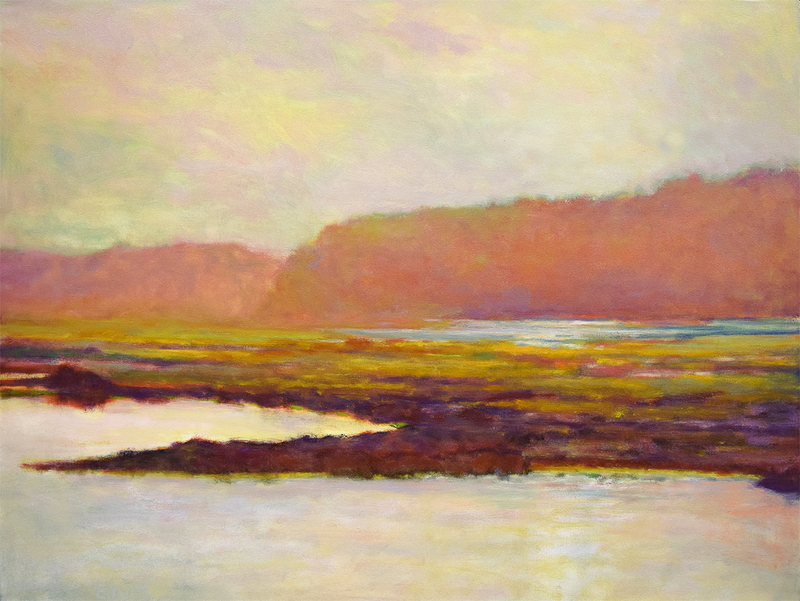 He is also represented by the Left Bank Gallery in Wellfleet, MA. I will be teaching a 2 1/2-Day Making it Fine Art / Advanced Strategies nearby in Marshfield, MA August 26-27, 2017. It is sponsored by the North River Art Society. Open to artists in all media. At the beginning of this oil I wanted to use colors I haven't used before and to keep everything fresh. This scene is very atmospheric with a haze everywhere that is also reflected in the water. There is a sun effect in the photo, but early on I decided to play that down. It was important for me to begin with a variety of colors, not knowing exactly how they would come together. There isn't a lot of visual information here, so the plan was to use color as a key interest. The land and tree masses are essentially three bands of color, so it felt essential to add more chroma in unexpected ways. As the painting developed it became apparent that the contrasts and clarity in the foreground would be important to this work and as the scene receded, just enough detail was maintained to carry the viewer's interest back to the trees and sky. Since this is a horizontal landscape, care was taken to simultaneously keep it interesting across the entire left to right space as well. There is much to see here but without high detail and a glow suffuses everything, bringing the oil to life. To make a work with this amount of subtlety is a bit like a minimalist poem with the point clearly made. It is so easy to overwork something like this. Turns out, this oil will be a prelude for a much larger one beginning this week. I'm really looking forward to revisiting this scene.